Are you ever bored of using the default ringtones in your android phone and couldn’t find a good ringtone that matches your requirement, then you got to try Type Your Ringtone app that entered the Google Play Store recently which will amaze you for sure. Type Your Ringtone is an android app that uses the Text-to-Speech feature in android to turn the text we type into a ringtone that can be directly used as a ringtone for incoming calls or notifications. The app has a super simple UI which makes it very feasible to play around with to create new ringtones. 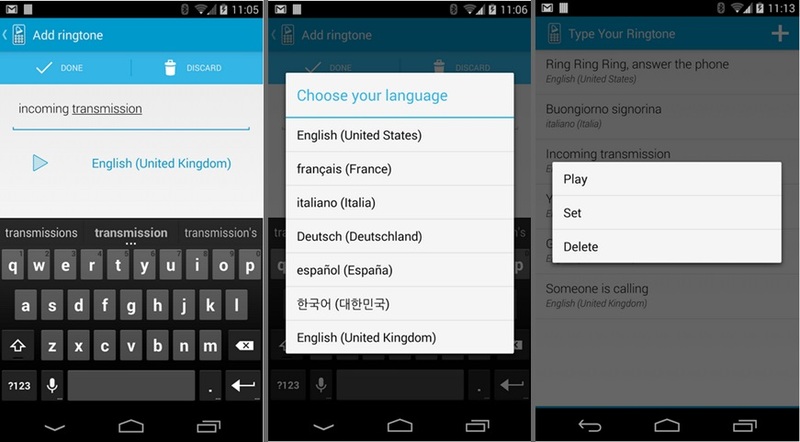 The app has an option to make new ringtones which opens a text editor where the desired text is given and there are options to select the desired language (currently supports only a few popular languages including English, Spanish, French and more…). User has the flexibility to listen to the ringtone before using it as a ringtone or notification tone. Cool isn’t it. Then head on to the Play Store (links below) to grab this little piece of Awesomeness! The ringtone voice is a bit robotic as it solely depends on the native TTS engine in android. Let us know your view on the app.